Matt Evans of Duncannon lived his life with passion and purpose. He enjoyed rooting for the Tennessee Volunteers football team, making his famous chili for family and friends, and playing golf and video games. Undeniably, his greatest love was his wife Kathy, son Brady, age 12, and daughter Taryn, age 13. Matt was diagnosed with pancreatic cancer in August 2017 and died in February 2018. 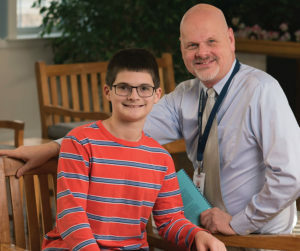 After spending much of December 2017 in the hospital, Matt came home on New Year’s Eve under the care of Homeland Hospice, a hospice program that serves communities throughout Central Pennsylvania. Through Homeland Hospice, Matt received nursing care and assistance, medical equipment and message therapy to help manage his symptoms. This support helped Matt spend every precious moment with his family. Homeland Hospice Bereavement Counselor, Brian Medkeff-Rose with Brady. A month before Matt died, Homeland connected the Evans family to pre-bereavement counseling with Brian Medkeff-Rose, M.Div., M.A., Bereavement Counselor at Homeland Hospice. Brian continued to meet with Brady and Taryn after the death of their father. During their conversations with Brian, Brady and Taryn enjoy talking about topics they once shared with their dad like sports, video games and books. Before his death, Matt passed along treasured gifts of significance to his children. He gave Taryn DVDs of ESPN’s 30 for 30 series, a collection of documentary-style sports stories. For Brady, he bestowed his cherished golf bag. These gifts serve as reminders of precious memories Brady and Taryn made with their father and the valuable life lessons they learned from him. Two days prior to Matt’s death, he was able to participate in a rite of passage for his son. Brady had completed his Cub Scout requirements and was scheduled to officially “bridge over” to Boy Scouts in the spring of 2018. Brady’s den leaders organized a special bridging ceremony at the Evans’ home so Matt could personally pin Brady with his Boy Scout pin, marking this important crossover in Scouting. Homeland Hospice’s bereavement support program is available to the bereaved of Homeland’s patients as well as anyone in the community who is experiencing grief. Bereavement support is available through phone calls, mailings, one-on-one consultations and support groups up to 13 months after the death of a loved one. Pre-bereavement counseling is also available for children and teens. To learn more, please contact Brian Medkeff-Rose at Homeland Hospice at (717) 221-7890.